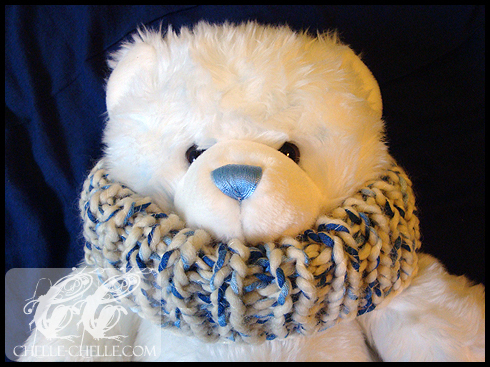 So this is the Cream & Berries Birthday Cowl. I didn’t use a pattern for this one, made it up when I started it as I was trying to figure out what to do. This was made for my mom and I used Rowan Ribbon Twist (super bulky weight yarn) on 8mm circular knitting needles (80cm length). This is my first finished project on circulars! What I liked about making this was that it was relatively quick (I started and finished it yesterday). But what I didn’t like about it was that I was actually trying to make it into a moebius (and therefore trying to twist the stitches at the very beginning), but I couldn’t get them to twist. Overall, it was a nice first project done on circulars. 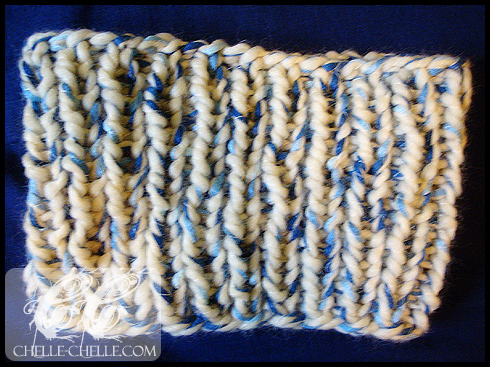 Not too difficult to do and I liked doing a 1×1 ribbing all throughout, it shows up quite nicely in the bulky yarn and the ribbon adds a nice accent to everything (especially since the ribbon is variegated throughout).